(RNs) and (LPNs), also called licensed vocational nurses (LVNs), provide physical and emotional support to people who are ill, disabled, injured or recovering from surgery. There are significant differences in how one prepares for each of these occupations. 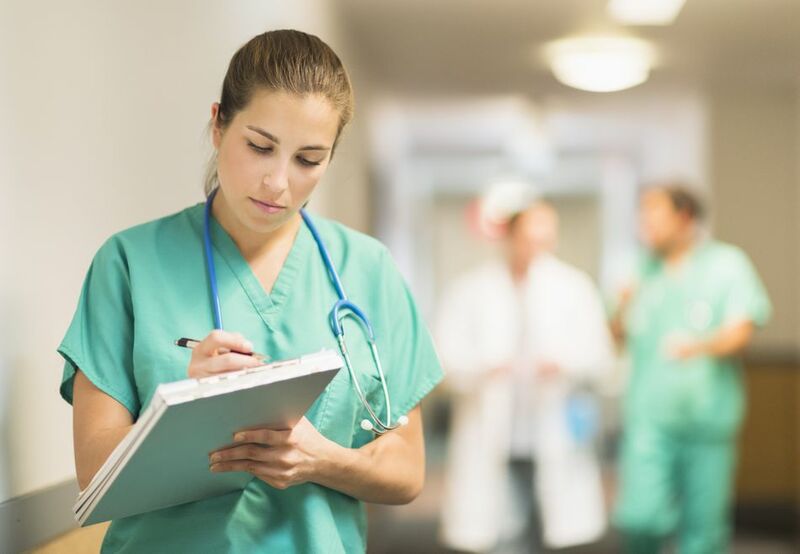 While formal training provides nurses with the technical skills needed to perform their jobs, there are qualities, called , that play a huge role in their success. Before deciding whether to pursue this occupation, it is a good idea to evaluate whether you have these personal characteristics. Both RNs and LPNs need what is called a service orientation, meaning they are willing to actively look for ways to help people. They should also be socially perceptive or aware of others' reactions. Nurses must have good listening and speaking skills, be detail-oriented and have good organizational and critical thinking skills. They should also be patient and emotionally stable. The educational requirements for registered and licensed practical nurses differ from each other greatly. To become an LPN one must complete a training program that lasts one year and combines classroom study with supervised clinical practice. Some technical and vocational schools, community colleges, high schools and hospitals offer these programs. Often credits earned in an LPN program can be transferred to an RN program. RNs train for between two and four years, earning a Bachelor's of Science Degree in Nursing (four years), an Associate Degree in Nursing (two years) or a diploma in nursing (three years). Students receive classroom instruction and supervised practical training in hospital departments. Some schools offer RN to Bachelor's Degree or RN to Master's degree programs for students who have Associate Degrees or Diplomas in Nursing. Regardless of the type of program, you plan to attend make sure it is one that is, at least, approved by the state in which you want to practice. If it is not, you won't be able to get licensed. You should also consider looking for a school that is nationally accredited by either the or the . Accreditation from one of these United States Department of Education approved agencies indicates that a nursing program has met certain standards. Since these agencies keep up with state requirements, you will be able to get licensed in another state should you have to move. The CCNE accredits only bachelor's degree and more advanced degree programs. Shorter programs including associate degree, diploma, and LPN programs, therefore, can only be accredited by the ACEN (Source: . allNursing Schools). Admission requirements and procedures differ by school and by type of program. Please check with the institutions in which you are interested to learn about their policies. In general, most institutions require a high school diploma or GED, a criminal background check, medical history and physical exam and at least one professional reference. Generally, when applying for admission to an associate or bachelor's degree RN program you usually have to follow the regular admissions protocol for the institution. That means they will likely ask for your high school transcript and scores from college entrance exams, for example, the SAT or ACT. Some nursing schools require applicants to take the . If you are applying for an associate degree in nursing or a diploma in nursing program you may also be required to have taken prerequisite coursework, including chemistry, anatomy, physiology, English, and math. You may be allowed to take some of these courses while you are enrolled in nursing school but you will have to take others before you begin. You may also have to take an entrance exam for admission to a practical nursing program. In addition, there may be prerequisites, for example, high school chemistry. After completing an RN or LPN program you will have to apply for a license in the state in which you want to work. State boards of nursing are responsible for issuing licenses and should be consulted for specific requirements. The has a of all their member boards on their website. A core component of licensure includes taking the . There are separate exams for RNs—the NCLEX-RN—and LPNs—the NCLEX-PN.